Listed below are A. parking options and fees for 1. Central Parking Garage (for Terminals A, B, C & E); 2. Terminal B Garage; 3. Terminal E Parking Lots 1 and 2; 4. Economy Parking (long-term parking for Terminals A, B, C and E); and B. General Parking Information. Cell Phone Waiting Lot If you are picking up a passenger, use the FREE (30-minutes max) Cell Phone Waiting Lot until your party has arrived, collected their luggage and calls you for pick-up at curb. Do not leave your car unattended while in the lot. For airline, traffic and parking information, call 1-800-235-6426 or TTY: 1-800-262-3335. Location: Within the airport on Harborside Drive, approximately � of a mile on your right between the Logan Office Center and Harborside Hyatt Hotel. Lost Parking Ticket Fee: Applicable Parking Fee + $5. Lost Parking Ticket Minimum Fee: Applicable Parking Fee + $5.00. B. 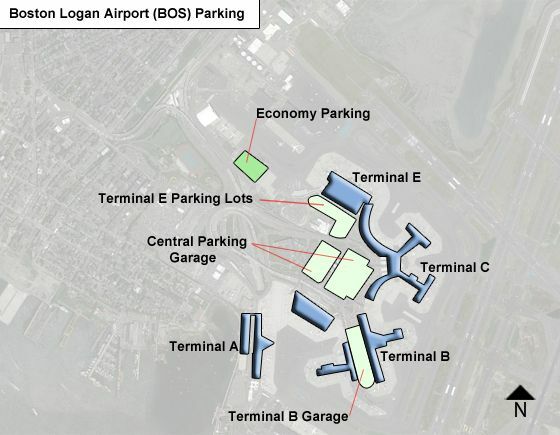 GENERAL PARKING INFORMATION - All parking facilities at Logan Airport have both daily and hourly rates. Curbside Parking is not allowed at any Terminal. For real-time parking availability: Tune into Logan Radio 1650AM. All Exit Express Parking Pay Stations accept the following credit cards: American Express, Discover, MasterCard and VISA. NOTE: Increased demand for parking causes periodic parking shortages on peak travel days such as Tuesday, Wednesday and Thursday, as well as during peak travel periods such as school vacations (February and April). For further parking information and assistance, call (617) 561-1673, 24 hrs/day. where is the closest parking for terminal A?